So there I was minding my own business at a local drug store when this little filly cantered in and parked "I've-got-a-cool-car-and-I'm taking-two-spaces-style" next to an unsightly grease spot. 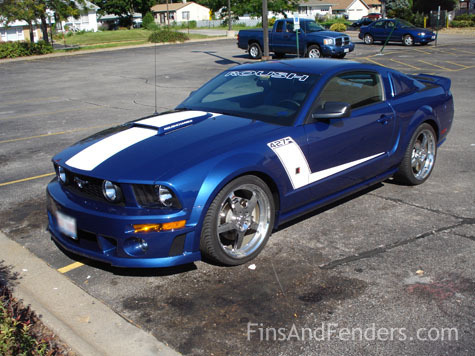 The 427R is a Roush version of the 2006 Ford Mustang and even standing still it makes my heart gallop a little faster. Thanks to a supercharger, the 427 is more than just a nifty model number and a fancy sticker, it's an indication of 427 hard-charging horses under the hood from a 4.5L, 3-valve V8. More beauty shots of the grease spot (and the car, too) can be viewed in the gallery. I was going to explain the whole horsepower thing (with a lot more "horse" lingo thrown in for good measure), but reconsidered since I don't have any idea what it means beyond the rather obvious WOW factor. However, these folks do know why we still use this antiquated phrase and what it all means (minus the tolerance-stretching horse lingo). If you are an unbridled Mustang fan, then toss a lasso over our "Mustangs at the Queen Mary" classic car DVD. When 200 Mustangs gather anywhere off Federal land or away from European dinner tables, we grab our video camera. This video features a 1964 1/2 Mustang Indianapolis 500 Pace Car, a 1968 Mustang California Special, a 1987 Mustang Saleen, and many more 'Stangs parked next to the majestic Queen Mary in Long Beach, California. Can you lead 200 horses to water? Find out by ordering your own copy of "Mustangs at the Queen Mary" today. It also makes a great holiday or birthday gift!